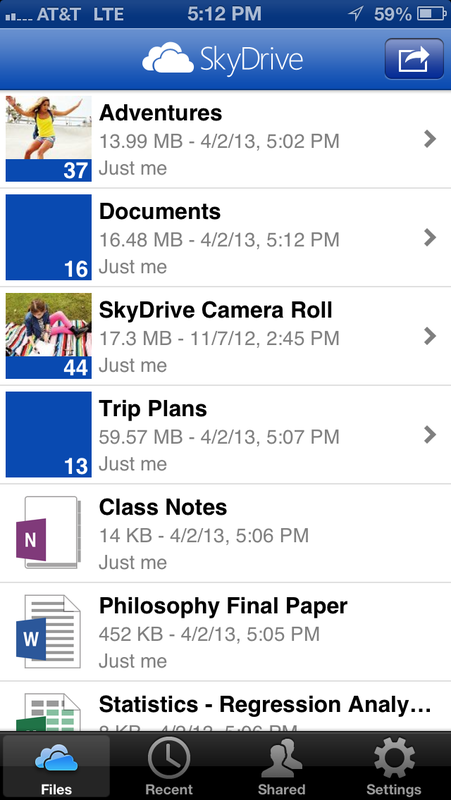 Microsoft on Wednesday announced the release of SkyDrive 3.0 for iOS, featuring a slew of new features. You can download the latest version of the app now directly from Apple’s App Store. TNW readers will remember that this is the same app that Apple and Microsoft were at war over. After Microsoft rolled out the ability for SkyDrive users to purchase more storage space on the service, it was stopped from updating its app in the App Store because the company didn’t and perhaps still does not pay Apple a 30 percent cut of the subscription revenue it generates. As you can see, the new version includes a revamped user interface (including new app icons). Microsoft has also finally added support for the iPhone 5 and the iPad mini. The biggest improvement is, however, in regards to the new photo features. You can now control the size of photos that you both upload or download (up to full resolution). Furthermore, photo metadata is retained when you upload to SkyDrive, a big boon for photography enthusiasts. Support for iPhone 5 and iPad Mini. Updated app icons and user experience. Works better with your photos: Download full resolution photos to your iPhone or iPad, control the size of photos you upload and download, and photo metadata is retained when you upload to SkyDrive. Opening and saving files to SkyDrive works better with other apps on your iOS devices. Many other small changes, bug fixes and performance improvements. This update is massive and definitely one all SkyDrive users should get if they have an iOS device. As for whether Microsoft ended up giving into Apple’s demands, we’re looking into it and we’ll let you know as soon as we know more.